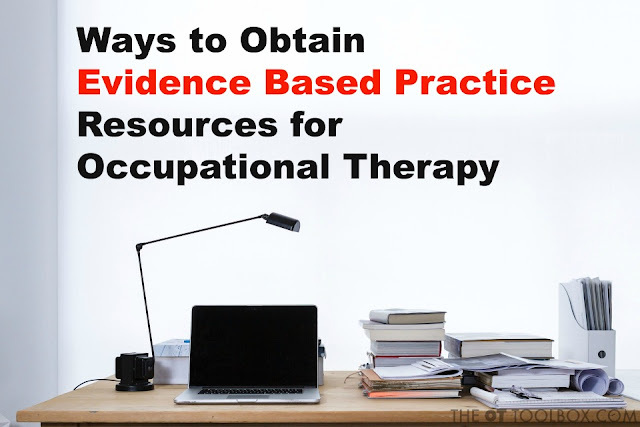 As Occupational Therapy practitioners, we value evidence-backed resources to use in clinical practice intervention and evaluation. But finding evidence-based resources can be a struggle for therapists. 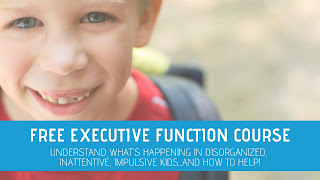 There are many reasons for difficulties in finding this information including time, effort, cost, opportunities, availability of resources, and other issues. Below you will find various ways to obtain evidence-based resources as occupational therapy practitioner. First, we'll dissect the various levels of evidenced based practice that OTs may encounter in searching for evidence based literature. Understanding the level of evidence-based practice is essential when determining the validity of sources. A framework for ranking evidence provides a hierarchy to enable different research methods to be ranked according to the validity of their findings. 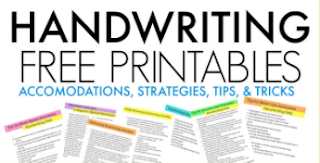 This link explains various grades and levels of evidence, defining types of evidence that provide reliable answers and best practice, while also describing the strength and rigor of a study. Hierarchy of evidence within Evidence Based Practice is effective in identifying quality and high-level research backed information. Understanding the levels of evidence is necessary when investigating a topic area in the literature. 1.) Continuing education opportunities- When obtaining professional development units needed to maintain licensure, therapists are able to connect with other therapists and are exposed to resources related to a specific question or topic. The struggle with this source of evidence-based practice is that continuing education opportunities can be pricey and limited. 2) The American Occupational Therapy Association (AOTA) publishes the American Journal of Occupational Therapy (AJOT) along with Special Interest Sections as a quarterly resource. AOTA has online resources with evidence-based practice information and articles available to members. The struggle with this means of obtaining evidence based practice and literature is that topics are limited and therapist may not be able to to obtain the evidence they need related to specific clinical questions. Another issue is that the cost of membership. 3.) National Board for Certification of Occupational Therapy (NBCOT) The national certification board for Occupational Therapy professionals provides an online portal for certificants, including evidence-based literature. Pro-Quest is one source for obtaining evidence-based articles needed in practice or for when researching needs. RefWorks is another tool for obtaining evidence-based literature that allows individuals to organize research references and easily create citations and bibliographies. 4.) American Occupational Therapy Foundation (AOTF) is an educational organization striving to It support occupational therapy research and public understanding of the important relationship between everyday activities (occupations) and health. AOTF creates a quarterly publication, the journal OTJR: Occupation, Participation, and Health. 5.) AOTA and AOTF jointly support OT Search, a literature database of occupational therapy and related health articles. OT Search requires a paid membership. 6.) The Australian Occupational Therapy Association (OTAUS) is another source of current research. Journal articles in the Australian Occupational Therapy Journal are available in the Wiley Online Library. 7.) The Canadian Association of Occupational Therapists (CAOT) publicizes the Canadian Journal of Occupational Therapy (CJOT). 8.) Royal College of Occupational Therapists (RCOT) offers the British Journal of Occupational Therapy (BJOT) to it's members. 10) Networking with co-workers- Evidence related to a clinic or therapy setting's particular needs can be shared in team meetings. This form of professional development is performed with colleagues or within small groups at a working place. However, many therapists have said that their workplace is limited in the number of therapists or they may even be working in isolation. This is especially true in the school based environment. 11). Magazines such as Advance for Occupational Therapist Practitioners, OT Practice published via AOTA, and Occupational Therapy Now (OT Now) published by RCOT can be a source of locating recent research through article archives. 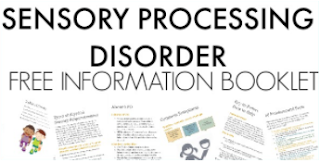 However taking the time to read through it and find specific answers can be a struggle for therapist. 12.) Online sources Today in OT is an online source for obtaining continuing education credits. College or university courses, meet-ups. Additionally, alumni are able to access research libraries in many cases. 13.) EBSCO Information Services provides research databases, e-journals, magazine subscriptions, e-books. 14.) State Association memberships and meetings. PubMed has more than 27 million citations for biomedical literature from MEDLINE, life science journals, and online books. 16.) The Agency for Healthcare Research and Quality promotes evidence-based practice and reviews the evidence in order to facilitate the translation of evidence-based research findings. 17.) The Cochrane Library is part of Cochrane, a network of researchers, professionals, patients, carers, and others, in order to produce valid and reliable health information that is free from commercial sponsorship and other conflicts of interest. 18.) Guideline is a division of the US Health and Human Services that provides a public resource for summaries of evidence-based clinical practice guidelines. 19.) Google Scholar. Therapists are able to search online for evidence-backed research using Google's tool titled google scholar. Simply type google scholar into the search bar and a library of research is available at your fingertips. However it can be difficult narrow down questions specific to clinical questions. Google Scholar offers a broad search for scholarly literature from a variety of sources including articles, theses, books, abstracts and court opinions, from academic publishers, professional societies, online repositories, universities and other web sites. 20.) Online Communities like The OT Toolbox Community. The OT Toolbox Community is an online source of networking and collaborating with occupational therapy practitioners from around the world. Members can share resources, add links to evidence-based practice, write blog posts, upload documents, and ask and answer questions. Explore the Evidence Based Practice Library (coming VERY soon!) 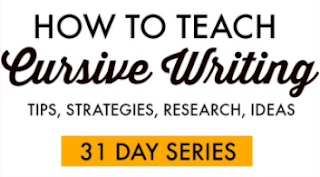 and add resources that you love with therapists as you promote and enhance the profession! Join us in The OT Toolbox Community! 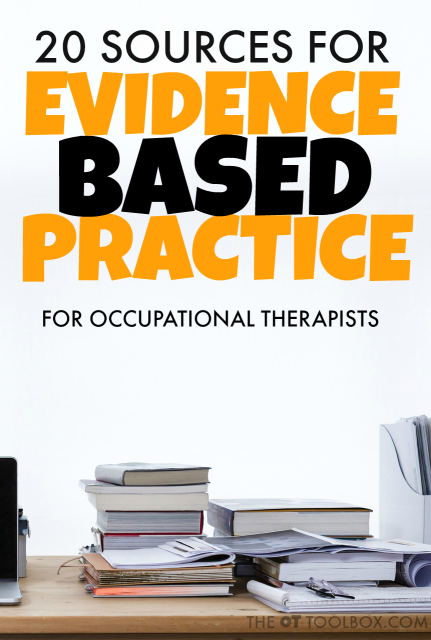 Where do you find occupational therapy evidence based literature? 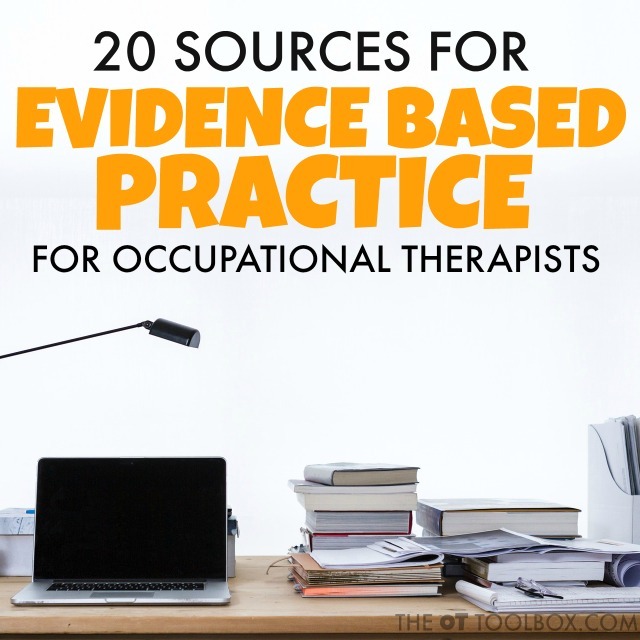 Let me know at theottoolbox@gmail.com and I will add it to this list as a resource that others can use to find the evidence they need in practice! Sackett DL, Strauss SE, Richardson WS, et al. Evidence-Based Medicine: How to Practice and Teach EBM. Philadelphia, Pa: Churchill-Livingstone; 2000.